ALL children deserve to get a great education. Our team has built strong relationships with many Memphis schools so we are ready to help parents and grandparents get the information and resources they need to find the best schools for their children. The “best” school is a school that not only provides a high-quality education but also is a good fit for your child and your family. If you want your child to attend a school he or she is not zoned for at the beginning of the school year, we will help you apply for schools through the General Choice Transfer process. If your child is having problems during the school year and would like to transfer to another school, we will assist you in that process as well. We often go with parents to meet with the principal and/or teacher and are able to resolve problems. But if we cannot come to an agreement that works for you and your child, we will help you find another school. Every child in Memphis and Shelby County has a zoned public school. Remember, no matter where you live or how much money you make, you also have choices for schooling. 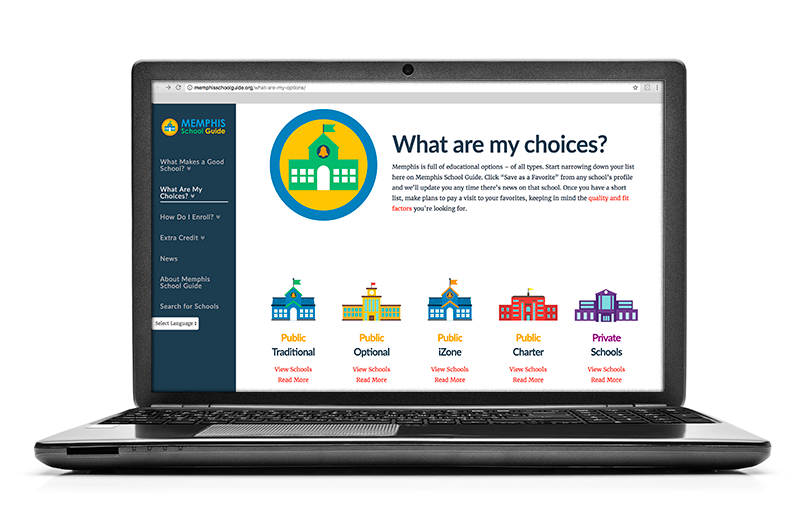 Memphis School Guide website can also help you navigate your choices.